Your first byline. Your first successful FOIA request. Your first published mistake. But Sizemore, the editor in chief of MSNBC.com and our Thursday keynote speaker, writes in her foreword to “Journalism Next” that there’s a new wrinkle for journalists in the 21st century. It’s an exciting place to be. It means that the ground before you hasn’t quite settled. It means your path isn’t set in stone. And it’s wonderfully appropriate to be talking about the edge here in Seattle, geographically located on the northwestern edge of the nation but also on the leading edge of many innovations. Exciting things happen here on the edge. 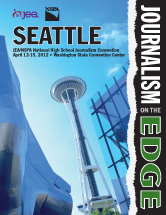 What exciting idea will you come away with that will revolutionize the journalism industry? The convention we’ve organized is a map you can use to navigate to the edge without going off a cliff. With keynotes from Sizemore and Dan Savage, hundreds of instructional breakout sessions and workshops, live contests and awards, you’re sure to find the innovation and inspiration you’re looking for. We’ve brought you here, to the edge. Taking the next step is up to you.